Chingri Macher Malaikari is one of the special dishes for me and is somehow responsible for making me charged to learn about different food and related processes as much as possible. Chingri Macher Malaikari is a Signature Bengali dish and is the first dish which I prepared first time in a family gathering when I was only 18 years old. We used to visit my Dida’s house on the subsequent Sunday of Jamai Shashti (a famous ritual prevailed in West Bengal to worship for the wellbeing of Son in Laws by their respective Mother in Laws) for a grand family gathering. The occasion was celebrated with lots of authentic and special Bengali dishes. Being part of a Middle-Class Joint family we were mostly served with normal food and naturally waiting for those kinds of special occasions to taste special delicacies. My Dida, Maa and Mashi’s used to prepare food for the gathering. I was mostly there to follow their cooking processes & finally entered the kitchen when I was 18 to prepare this dish! I can’t be able to forget that day. Along with lots of appreciation, I was praised with a negative yet sarcastic comment by one of my relatives that I don’t know how to cook this signature dish and this is quite normal since in middle-class families we eat these dishes on rare occasion and hence not aware of the proper process! I was disappointed and wounded like anything and that was quite normal for a teenager. 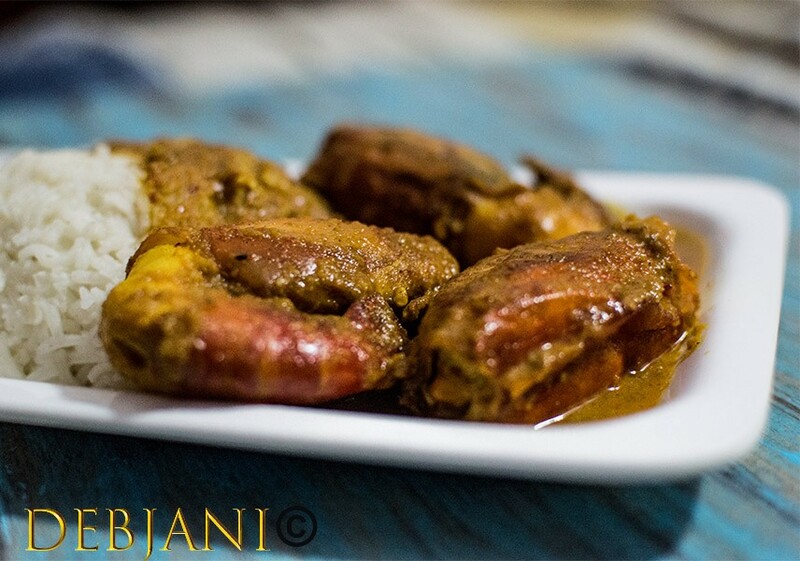 From then I prepped this dish several time with the same recipe and I followed the recipe of Malaikari by different chefs/ cooks/ bloggers just out of curiosity to check whether am I right or AM I RIGHT! 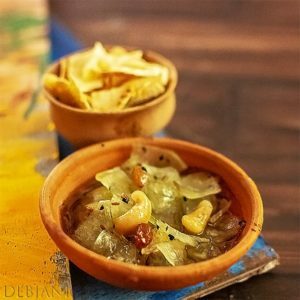 I was waiting to post it in Debjanir Rannaghar on some special occasion and what could have been better than posting Chingri Macher Malaikari as the 100th post of my blog and yes, today I am open for any positive and negative comment with an open heart. 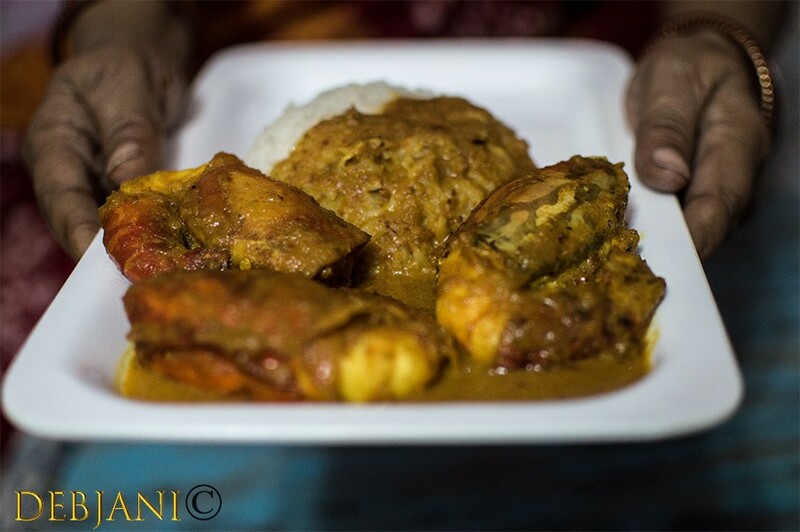 Anyway, let me come back to Chingri Macher Malaikari. This is a classic preparation with Prawns and flavored with Coconut Milk! We Bongs are very good at changing the names for the ease of our pronunciation. 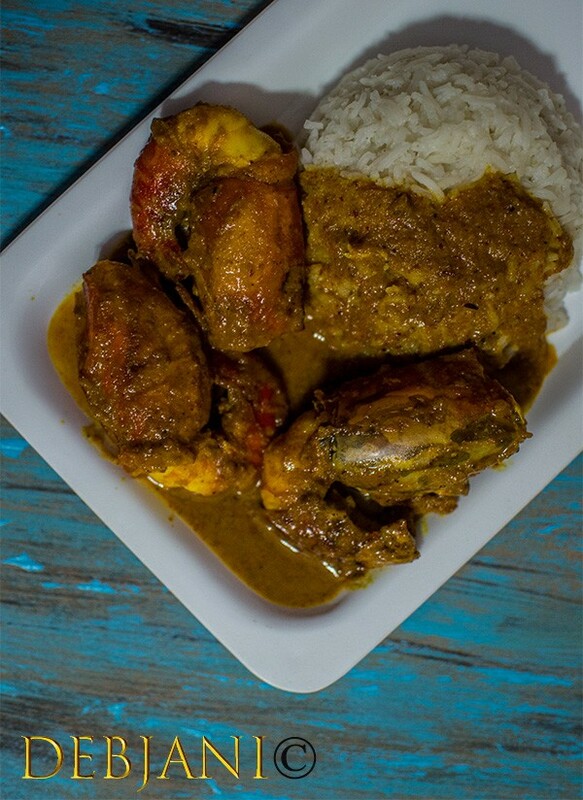 Chingri Macher Malaikari is one of the greatest examples of this name changing game where Malaikari is actually “Maloy Curry”. 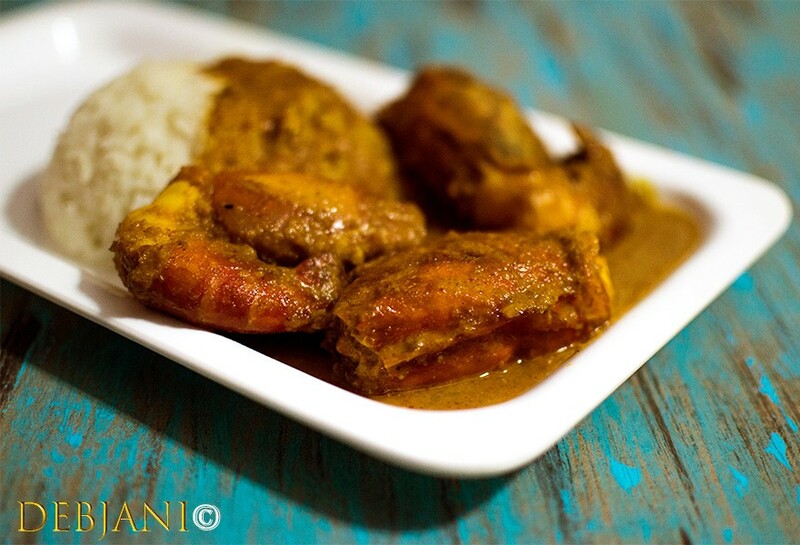 A prawn Curry flavored with coconut milk originally from Malaysia is modified into a Signature Bengali Dish known as Chingri Macher Malaikari. A prawn Curry flavored with coconut milk originally from Malaysia is modified into a Signature Bengali Dish known as Chingri Macher Malaikari. It is ideal to use Prawns with the shell to prepare Chingri Macher Malaikari. However, in absence of shelled Prawn frozen and de-shelled Prawns can also be used. Wash Prawns thoroughly and devein each and every prawn before cooking. Now rub some Salt and Turmeric Powder to the Prawns and leave those for 15 minutes. Make a smooth paste of Onions and Tomatoes separately. Heat the oil in a deep vessel. Fry Prawns one by one without tempering the shell in medium flame until the Prawns turn pink in color. After straining the Prawns from the hot oil add half of the Ghee in the Oil. Temper the Ghee-Oil mixture with the Whole spices which are Cinnamon, Dried Red Chilli, Green Cardamom, Black Cardamom, Clove and Bay Leave. Now add Onion paste to the tempering. Cook for around 3-4 minutes or till the paste cooked properly and turned pinkish brown in color. Add Tomato Paste and again cook for 1 minute. Add Ginger and Garlic Paste and cook for 1 minute. Now add Turmeric Powder, Sugar, Salt, Red Chilli Powder, Cumin Powder, and half of the Garam Masala Powder to the mixture. Cook for 3-4 minutes in low flame until oil separates from the mixture. If required add 1 tsp. of water in between. Now add Coconut Milk to the Mixture and mix properly. Add 2 Cup of Water and bring it to boil. Finally, add Fried Prawns to the gravy. Cover the pan with a lid and cook for 5-6 minutes in low flame till the gravy thickens to a medium consistency. Add remaining Garam Masala and Ghee to Chingri Macher Malaikari and mix properly. Give the dish a rest of 5 minutes before serving. Serving Suggestion: Chingri Macher Malaikari can be served with Steamed rice, Bengali Basanti Pulao, Ghee Bhat or with Hot Luchi. #Pictures updated in 2017; Hand model is my mother 🙂 .